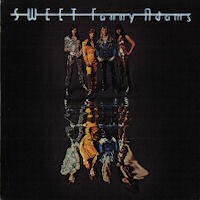 It is the first true album of the SWEET that was released in early spring of 1974. It has particular importance, since at last the band that languished in the producers’ cramp and were condemned to make single hits that were forced down their throats got possibility to make an album. Upto then, SWEET has gratified their creativity in the B sides of their singles in the way that limited studio time has been available for recording their own composition. Naturally, the band’s gorgeousness has been evident from their B sides, but the real indicator is an album. The Sweet Fanny Adams has elementary and devastating power, it is the ecstatic winging of the soul that has been released from the prison, the eruption of emotion that has stuck in. Consequently it is full of rage, anger and is very lusty. Then they were not set free from the Chinn-Chapman stud, but they felt that they were making ther first steps. This album is not so solid like Desolation Boulevard and Give Us A Wink that followed it. It includes compositions of a genius: 5 songs (Set Me Free, No You Don’t, Sweet F. A., Restless, Into The Night) from the 9 included in the album belong to the most outstanding works of the rock history, while moderate songs and two nadirs (Peppermint Twist, AC-DC) are also included in it. The merciless buoyancy is so fascinating that the weaker compostions cannot considerably arrest the stream of the magnificent music. It can be felt that all four members glowed with very high intensity during the recordings. This album is on the revolt and the acquittance from the hobbles forced on the art or the individuals; acquittance from the situation when show-business kills the art. But it tells, even in a wider sense, about the break-out from desperate situations. They originally wanted “We’re Revolting” to be the title of the album but it was not allowed. There are 3 songs in which not Brian is the lead vocalist: in two of the three songs Steve handles the lead vocal (No You Don’t, Restless) and in one Andy does it (Into The Night). It is the only album upto the album Level Headed, released in 1978, where the superbly singing Steve handles lead vocal, and to top it all, even in two songs. Upto this album it did not still happened, he only sang some refrain part. The album is characterized by devastating solos and elementary buoyancy, magnificent choirs, rich guitar and drum sound. It has a fascinating raw brutality. The studio crew succeeded in adjusting the perfect dynamic sounding but maybe is a bit shifted to the higher regions than the optimal. Two years later, Give Us A Wink whose sounding tragically weak, would have necessitated (and deserved) a sound like this. Sweet Fanny Adams is a milestone in the history of rock music. It is one of the determinative compositions in hard rock that was composed by Andy Scott himself. The title itself is announcing, as opening piece, shows well the main topic of the album (“Gagged, ball and chain/Feel just the same/Heads on the wall/Maybe you’re just playing games/Set me free”). The number of songs that have so devastating twist like this is very small even in the rock music that is full of hard, energetic songs. Elementary power is erupting from them. The rhythm and the basic riff is almost the same like that in DEEP PURPLE’s Fireball, but to accuse SWEET for stealing from the Fireball still does not come to anybody’s mind. Anyway, Fireball is not so multifarious like Set Me Free. The individualness and high level of this composition keeps the possibility of any accusing out. The song is characterized by many changings and exciting momentary interruption, there is something in each moment that is vibrating and moving, each instrument is coming out with some interesting new theme. Andy is performing a compelling improvisation in the middle section. The rhythm of the song is recalling the speedy pulsation of the sound of the old steam locomotives when they run with maximum speed. The listener is feeling as if (s)he could not keep step with it and continuously was dropped behind. It is exciting as, in this brutally hard and twisting song, fine choir is singing the descending “ah-ah-ah” before Brian’s hard “set me free” line. With this song, Andy Scott showed to the world that how many colours and tenuousnesses can be fit in a killer hard rock composition in the way that the elementary power of it does not decrease in the same time, what is more, is still emphasized in some place. It is a dazzling and fascinating album opening. It is a song of moderate rhythm, not outstanding, but includes some good musical idea that are realized well. Furthermore it inludes a short closing movement that can reap laurels for any of the best bands if guitar-bass-drum trio is concerned. It is interesting that Brian is singing the strophes almost by whispering in front of the hard, rousing guitars and it is very interesting as the high-sounding guitar, after the exaggeratedly long-drawn-out bridge, is “gurgling the song up” to the refrain. The closing movement following the last refrain is the part of the song that is very diffcult to describe. It is a trio fantasy inspired by jazz for Andy’s sonorous electric guitar, for Steve”s brutally orotund six string bass that is thundering but precise, and for Mick’s fine and delicious drums playing unpredictable variations continuously. It is superb and elegant but still cool. The way it is realized is to be taught: as Andy’s tense guitar is beginning, then is entering Steve’s bass, when the listener is frightened of that the loudspeakers will be immediately smashed into smithereens. This theme is completely separated from Heartbreak Today and no any theme of the song is coming back during it. It is one of the most brutal and, in the same time, most fascinating compositions of all times. It has not speedy rhythm, it is not of devastating twist, but is still incredibly shocking piece. Merely its opening is awesome: the guitar-bass-trio is booming a short and a long bar that is then descendingly “dismembered”. Steve’s angrily whining, almost praying and ululating lead vocal is yowling in it. His voice is very clear and every listener can feel that he is handling his voice masterfully. It is shocking as he is performing it: by a voice suffocating from pain and almost is becoming crying. He is starting to sing each line in high voice and is awesomely descending, falling to the deep. (“You keep on playing your reckless games/that will give you fame/But I’ll take the blame for your name/We’ll you think you’ve got my life in your hands/But I’m a man, I’m a man/And I’ve got my own plans, I’m a man”). During it, Andy’s sharp but sonorous guitar pulsation is serving as background. Steve’s voice is then clinging as the alpinist being in sliding down is gripping the rock’s edge, and in the same time the other instruments are also entering (“I’m going down/Yes, I am, yes I am/And I don’t give a damn”). Here in the bridge, the depressing feeling is easing a bit. The choir is rather uproariously rabbiting with very high voices than singing the refrain to which Steve is replying with a talked singing (“No you don’t – have to trat me like a fool/No you don’t – have to be so bloody cool/No you don’t – have to make up all the rules/…”). The listener is fellingly sitting in the armchair, but an additonal astonishing thing is happening: the music suddenly is stopped after the second refrain and strange cello bowings or more exactly cello raspings is appearing by a portentous pulsation on the same voice. Andy is that who is playing on the cello. The drum and the acoustic guitar is entering that are following the cello in a simple ritual rhythm. A killer theme is starting with this: the refrain is appearing but not Steve is who replying to the choir’s “No you don’t”, but Andy, with a merciless cello play going from high to low. At its final part it is starting to be intolerable. The listener is perishingly staring and needs a time for coming back. Andy and the others enchanted bizarre and extraordinary moments for him or her. This song, in the shadow of the No You Don’t, seems to be easy a bit, but is not wrong. The main problem is that to be a song after the No You Don’t is a hard work. The Rebel Rouser is a breezy song, but there is nothing in it that is to be excepted. It recalls Hellraiser a bit both in its basic riff and its melodic line, but includes more idea than their hit from the previous year. It is a disppointing part of the album, the nadir that deteriorates the closing part of the side A. Probably they wanted to introduce stealthily something onto the album from feeling of their live gigs on which they played the fifties’ rock’n’roll very individually and delightfully. A forestate is given from them on the CD that includes the recordings of the live gig that has been held in the Rainbow Theatre in 1973. Here on the album, Peppermint Twist is empty, sleepy and dull. However we are indemnified for this disappointment by the next three composition. As early as its beginning this song is devastating. The opening part is based on a speedy riff loudening quickly, played on electric guitar that recalls rather the sound of a hurtling motor-cycle. Brian is singing the verse lines with angry arrogance and shouting. In the refrain he is screamingly singing the reply to the choir. While it is pure hard rock, the base is pure jazz-rock due to both the quick and fulminatingly deeply cracking passages that are played on six string bass by Steve and Mick’s drum variations. The intermezzo-like part, in which the choir is singing the “ah-ah-ah F. A.”, is sounding a bit cosmicly. During it Andy is playing rapid passages on electric guitar that are running about up and down. It is always followed by a simple, ascending moog theme to which the slow rhythm is given by Mick’s bells. Then the twisting, din-like main riff is coming. In addition to these fine movements and variations, the song’s main values are Andy’s electric guitar improvisations that are very cleverly supported by Steve’s six string bass and Mick’s drum. This is a piece of fascinating energy, it is bursting with power and of raw sounding. It is a superb song that has very unusual atmosphere. Both in its rhythming and its melodic line considerably differs from the more traditional SWEET sounding. Restless is earth-bound and mystic in the same time, and these two completely different worlds self-evidently live together in it: the basic rhythm is rhythm & blues, while the feeling is completely cosmic in some place. It has a lamely stepping rhythm that is emphasized by Steve’s six string bass that is sounding by strange knocking and percussing. The number of bassists who can take the advantages of the Rickenbacker so superbly like Steve is very small. Steve in this song is the lead vocalist also whose singing is unusually souly and bluesy in the verses and the refrains. The positively mystic bridge, however, is subtending and is giving rather only a background for the guitar that is progressing step-by-step with strange lingered voices. The mysterious bridge is the most valued part of this composition that is infinitized actually: the listener believes that it will never be closed, but will then graually fade. Its lyrics is only that “I’m so restless, so restless”, but it is performed very specially. Steve is forewhispering it to the choir that is then rather fluting it instead of singing as if the wind blew the faraway voices that are echoes of Steve’s whisper. Steve is blasting into this surrealistic feeling in the bluesy singing style of the strophes and starting to sing the refrain. It is a very drastic change that is fairly irritating the listener and, by this, SWEET are superbly picturing the feeling of nervousness and distraction that is the song’s theme. The song is telling about someone who came to know that he has lived wildly and without using his mind, wasted his emotions, but once fell in love and would like to change, but fears from that it’s too late and there is no get-out for him. (…/Well I’m staying on the wild side/Always hit the higher ground/Nothing I do could amaze me…./…/We’ll I’ve always been ourageous/But a change has gotta come/Making up my mind/Was never easy/I was born to late to love you/The day will never come/It’s love that I need/So don’t tease me…”). In the middle section that is low-key and floating, even Andy’s improvisation is low-key. It is not a solo, he rather is distilling short samples or fragments to us. The atmosphere of the closing movement is the same and there is no better way to end like the gradual fading. It is a magnificent composition that is one of the most excellent works of the album. As the listener gradually fell into a swoon due to the musing feeling of the closing part of the previous song sending everyone to the world of dreams, weighty and slow drumming is awakening him or her. This ritual movement is the beginning of an additional masterpiece that was composed by Andy himself. This is the opening theme of Into The Night, and after a hard dub-a-dub, Andy’s very characteristic riff is coming that has become legendary actually. The rhythm is turning to pulsating and we are hearing Andy’s brazen voice singing from the throat. He is only throwawaying the verse lines as if he wanted to be through with it rapidly. It is a bit like a student who, though knows the lesson well, has no vein for repetition and tells the lesson in stuck-up way, though correctly. In the refrain, Andy is singing in still more stucp-up way that is not true singing, but is rather speaking as he is gutturally and vigorously replying to the choir’s line. He is lingering the end of the line “but now it’s all stopped” than the choir is lingering the “aaaaaaah” as if he was not able to finish his line in the same time with the choir. He is still pressing the end of the line gutturally and strainedly. This strained lingering is emphasizing the feeling of more and more perricious prolapse. And the pressing of the end of the line is picturing a last effort to find the way back up to the surface. The song is telling about the falling. If someone has once become the king of the nightlife, his dolce vita takes a very limited period and after it only an unstoppable sinkage can come. But it can be understood in general: to come around a doubtful, danger thing is too risky, because imposible to predict whether any return can be found. (“I was a king thought of everything/Into the night/Then I was out everybody shout/Into the night/…/I couldn’t lose/When I was on top/I couldn’t lose/But now it’s all stopped…/…/I’m in a sea floating on one knee/Into the night/I think’ll drown oh I’m going down/Into the night/Is this dream in a golden beam/Into the night/I look up high and there’s no sky…”). Even the teller cannot decide whether it is a dreammare or reality (“Is this dream in a golden beam”), but the instrumental middle section, with the terrific noises and Mick’s portentous tolling, make an impression rather of dreammare. No any guitar solo can be found here, Andy is enchanting the fearsome noises on moog only. At the end, Andy’s electric guitar voices are being “dismembered” by strangely reverberating, and without any break the last song of the album is starting. Another nadir on the album in addition to the Peppermint Twist. It is the worst composition of the Chinn-Chapman duet after their silly bubble-gum songs. This song is primitive, thick and dull song despite its high speed and hardness. To close the album with this song, what is more to put it on the album at all, was a big mistake, in my opinion. Instead of it, what a great closing song would have been Own Up, Take A Look At Yourself that was released two months before as B side of Teenage Rampage. It is to be noted, however, that the band probably played this piece far better in their live gigs because the simple but buoyant backgorund gives good base for variations and improvisations. Leastwise the recordings of the Japanese tour in 1976 that came to light far later bear witness about this.